I write because for years I have been intrigue by a “castle” on Sleepers island on Lake Winnipesaukee in Alton, New Hampshire. It is modest in size and shares the island with many similar sized lake homes. It appears to be a private residence. I know little else about it. 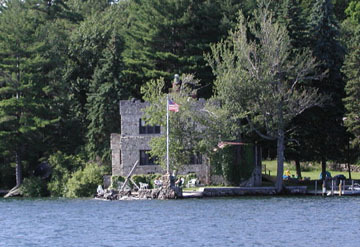 This is a picture of the "castle" on Sleeper's Island, Lake Winnipesaukee, NH. Rumor has it that the owner wanted to get away from people and kept dogs on the island to discourage visitors. I assume it was Sleeper's castle. Someone on the Form on www.winnipesaukee.com should be able to give you more information. It was (at least back in the 1960’s) known as “Hale’s Castle”. In the early to mid 1960’s, it was converted to a B & B known as “Castlewood”, and had a guest pick-up service from a marina on the west shore of the lake near Mt. Major. In addition to the “castle”, there were several guest rooms in a “Boat-el”, which was located just to the right of the main house, and had dock space in front of it. At the time my family stayed there, it was owned by friends of my family, and was one of only about 3 homes on the island, all of which were seasonal. I believe the B & B operation was rather short-lived, and aside from a few old childhood photos and some 8mm home movies, have very little other information. My parents owned the Sleepers Island Castle from in the late seventies through mid eighties. It was built in 1911. The work was performed by the same folks who built Castle in the clouds, which was built around the same time. There is a grave yard and originally a barn on the property as well. I stumbled on your site and thought I would try to add to the information regarding Hale's Castle. It is, indeed, Hale's Castle, built in 1911. My memory is somewhat foggy as to precise dates but my family (the Ford Brewers) owned the property from the early sixties to the early seventies. The island had been purchased by a couple of fellows and was broken down into lots. One of the investors was Henry Maxfield, whose Real Estate signs can be seen all over the Lakes Region these days. The previous writer is correct, it was run as a summer business for a number of years as "Castlewood". We ran a ferry from the West Alton Marina to accommodate guests. We never had guests in the Castle but rented units in the Boat-el and a cottage. We also ran a small sandwich shop on the covered porch of the Castle. My understanding is that Mr. Hale was a full time resident of the island and maintained horses and bridle paths. I once found a horse skeleton on the Rattlesnake side of the island. Some of the bridle paths are still visible. A small cemetery exists in the middle of the island which contains Hale, his first wife and his housekeeper. His second wife ultimately sold the island. When we lived there, we were convinced that the castle had a friendly ghost. Whether of not it was Hale, we never knew but there was frequently strange things happening which we were hard pressed to explain. Although we never told the buyers of the castle about our ghost, they sold it soon after because the wife became convinced she was living with a ghost. Over the years the condition of the property deteriorated. Ultimately (sometime in the late 80's, I think), the property sold to the Mercers who restored the property and continue to live there today. My grandparents Mr and Mrs Mahoney were the caretakers of the castle. (The two old people that scared that writer.) Interesting they were always friendly! They worked for the park service. I went to visit them every year and during my childhood would dream that I was the princess of that castle. There was a park bellow and and a storage house of all kinds of crafts items. (During the summers camps would come to the castle and kids would play and be occupied for long hours with all the fun items in that storage area. I would like to know who is living in that house on the side of the castle now it is the same one my grandparents lived in. It had two bedrooms in it. A living room area and a kitchen. It was comfortable and a great place to be. Thanks to Jack Brown for sending the photo.